The “natural” government debt ceiling – fact or fiction? In the US the debt ceiling is a legal construct that requires majority in both chambers to allow government to allow taking on more debt. Whether this makes sense is the subject of an ongoing debate, but a related question often comes up. If there would not be a debt ceiling, how much money could government spend or, how high could government debt be? It is not possible to adequately address every question raised by “debt phoebes”. One of the most common concerns, however, clearly illustrates the unfounded fear that arises from confusing private borrowing with public borrowing. The question is based on an image of Uncle Sam being turned away by lenders and being stuck without financing. Fear the government will be unable to sell securities overlooks the mechanics of the process itself. The imperative of borrowing is interest rate support. By issuing government securities, the government offers banks an opportunity to exchange non-interest bearing reserves for interest bearing securities. If all banks would rather earn zero interest payments from the government, the refusal to accept interest becomes a de facto tax on the banking system. From the Treasury’s point of view the government’s ability to attract any lenders would actually be a benefit. Imagine, the government spends money and the banking system, in a sense, lends the money at zero interest by refusing to accept interest on the new deposits which the government spending created. Instead, the banking system is content to leave the money in a non-interest bearing account at the Fed. The money is held at the Fed either way – it has no other existence. If the money is left as excess reserves it sits in a non-interest bearing account at the Fed. If the money is loaned to the government by purchasing securities it again is held at the government’s account at the Fed. Let me just add that since the liabilities in the global economy denominated is US dollars are very large it is unlikely that people stop accepting the US dollar, in both the US and the world at large. This graph from Ivashina et al. (2012) shows you the absolute size of those liabilities. Even if the US dollar comes under pressure, anyone with US dollar liabilities will be happy to purchase them on the cheap, which basically guarantees a large demand for the currency. For comparison, the values for M1 and M2 from Fed data (seasonally adjusted) as of August 2013 are $2552.5 billion and $10771.0 billion respectively. 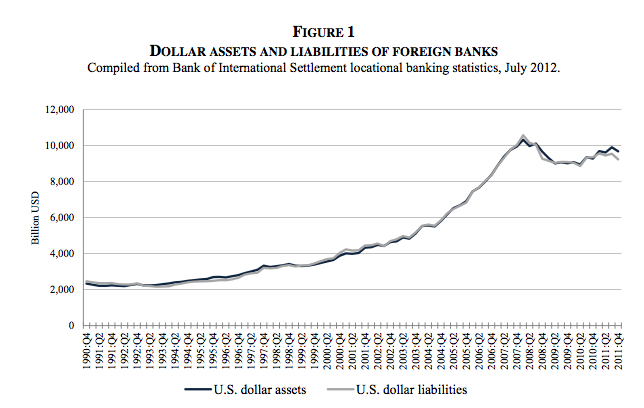 Note that the graph below shows liabilities of foreign banks only. Of course, there are also foreign non-banks with dollar liabilities and millions of debt contracts written in dollars inside the US. And then there is the US government’s power of corecion, namely to impose tax liability’s on its people and thus creating a demand for US dollars. « The Greek bail-out: where did the money go? Agreed. Making a global rejection of the USD even more unlikely is the lack of any realistic replacement. Certainly there is no other country willing to run large trade deficits and with a sufficiently large and diverse economy to absorb the massive liabilities which go with controlling the world’s reserve currency. As for Warren, he has such a talent for simplifying complexity. Banks can have dollar balances in reserve accounts or securities accounts. One pays more interest than the other (assuming the Fed continues paying IOR), otherwise there is functionally little difference.